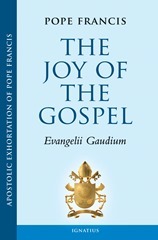 We were all very enthused to see the publication this week of the Holy Fathers Apostolic Exhortation Evangelii Gaudium. When the Holy Father published the encyclical “Lumen Fidei,” it was a joint project with Pope Benedict, but now we have a writing which is truly “Franciscan” – that Pope Francis is giving to us. 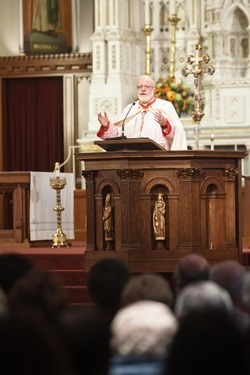 Many of the themes are ones that he has often spoken about in his conferences, audiences and homilies. 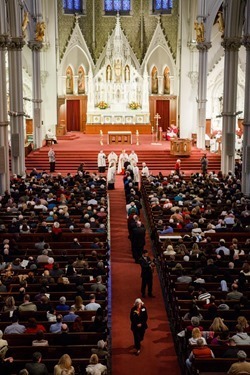 Certainly, we see his great desire to make the Church one that is compassionate, that is a community of faith overcoming the globalization of indifference, one in which people are concerned about the homeless person who dies because they are exposed to the elements, and where the economy must be at the service of humanity and not an exercise in greed and selfishness. The Holy Father, of course coming from Latin America and having seen in many countries great poverty and suffering, is very strong in his analysis. He is also challenging us in our preaching to be able to reach the people, to bring the message of Christ and to express the joy of our faith. Indeed, even the name of this Apostolic Exhortation betokens the kind of enthusiasm that the Holy Father exudes when it comes to evangelization and sharing the good news of the Gospel to the world. Also, the Holy Father, while stressing compassion and forgiveness, is also very quick to point out the preciousness of life in our obligation to defend it. He sees abortion as an attack on life, and not a solution to people’s problems. But, at the same time, he recognizes that people often fail to reach out to women in their moments of crisis, to help them to be able to make a better decision and to be able to save their children. It is an extraordinary document that is very doctrinal in its expression, but at the same time like all the Holy Father’s teachings, it is very accessible. I believe it is not a document that people will find offputting or difficult to receive. The message of the Apostolic Exhortation is quite beautiful, and I would encourage everyone to read it firsthand. Last Thursday we had a reception here at the Pastoral Center for those who work in the archdiocese and have been so supportive of our Catholic Appeal. It was an opportunity for me to personally thank our staff for their participation in the Appeal and their work on behalf of the Catholic appeal. 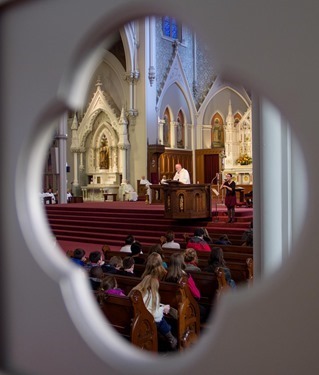 The money that comes in from the Catholic Appeal is the lifeblood of the archdiocese and allows us to fulfill so many aspects of our mission. 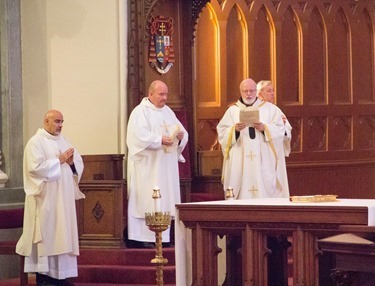 We are particularly grateful for the benefactors who support us, realizing that there are more claims on the services of the Church during hard economic times. 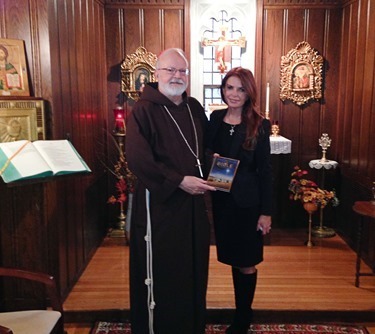 Friday, I met with Roma Downey at the Cathedral. 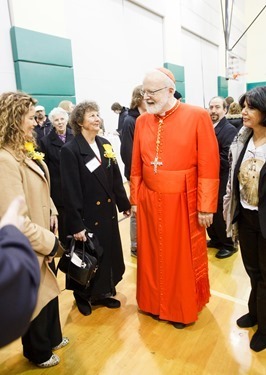 Cardinal Wuerl had suggested that she come and see me. Of course, it was like my encounter with Gloria Estefan that I often speak about. Since I do not have a television, I do not know all the celebrities that perhaps I should know. So, when Roma came to see me, I had no idea who she was. I came to find out she was the star of “Touched by an Angel,” which was a very popular television program. She also created the Bible series on The History Channel, which I understand was one of the most-watched television series they have produced. It was very widely acclaimed as a very beautiful and cogent exposition of biblical history. She gave me a copy of the DVD of that program. She came also to talk about her newest project that revolves around the life of Christ, called Son of God, that will come out in February. She showed me some clips from the film. I was very encouraged by what I saw and I think this will be a wonderful movie that will expose many Americans to the life of Christ and the Gospel. I know it will be an extraordinary catechetical tool for the Church — and I suspect it will be a box office hit, as well. Friday evening, I had Vespers and dinner with our seminarians who are in their third year of theology. As I have mentioned, I have been meeting with the seminarians by class with the goal of getting to know them better and spending some time with them. We gathered for Vespers, followed by dinner and a long conversation. It was a very encouraging and wonderful evening. Saturday, I went to Catholic Charities Yawkey Center in Dorchester to participate in their distribution of Thanksgiving meals. 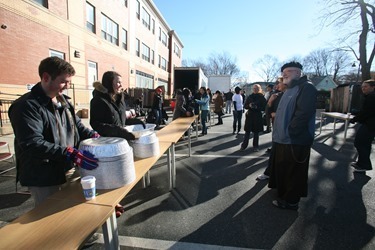 In conjunction with the United Way, over 5000 families throughout Eastern Massachusetts have received Thanksgiving meals. At the Yawkey Center alone, they distributed about 1500 turkeys. Debbie Rambo, her staff and volunteers had the process very well organized. They gave each family a turkey, a bag of groceries and even a pan to cook the turkey in. All those who received the meal package were very excited and grateful. Thanksgiving is such a beautiful American feast that reminds us of our obligation to care for others, as the Holy Father is always urging us to do. 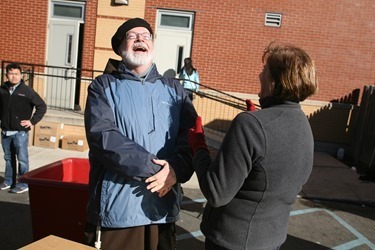 The best sign of our gratitude to God is our willingness to share the blessings that we have received, and share them generously with our brothers and sisters in need. While the economic downturn that began in 2008 seems to have begun to ease for some, it is important that we remember that many people are still suffering from the lasting effects of the recession – many are unemployed or underemployed and can barely make ends meet. They depend upon the food distribution centers such as those of Catholic Charities to be able to feed their families. 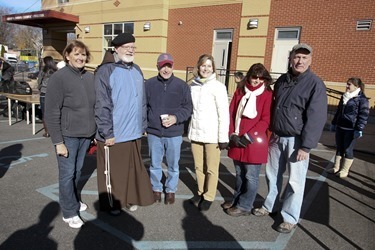 We are very grateful to all those who support the efforts of Catholic Charities. 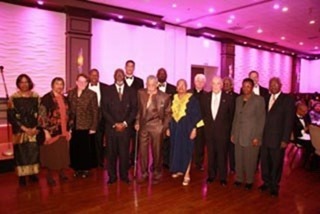 Saturday evening, I attended the Office for Black Catholics’ 20th Anniversary Bishop Healy Award Dinner. Lorna Deroses and her staff did an excellent job organizing the dinner, which was a great success. There were over 500 people in attendance. Donna Latson Gittens and her husband, Robert Gittens, were the masters of ceremony for the evening. 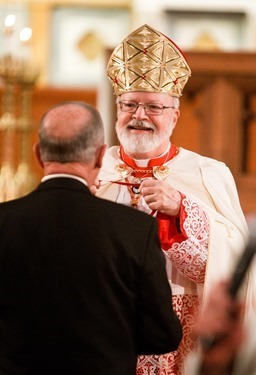 Father Cyprian Davis, O.S.B., a monk of the Benedictine Monastery of St. Meinrad Archabbey, was the keynote speaker for the dinner, reprising that role from the first Bishop Healy dinner in 1993. Father Cyprian is the author of the extraordinary book, “The History of Black Catholics in the United States.” I read the book many years ago but still benefit from this important resource. 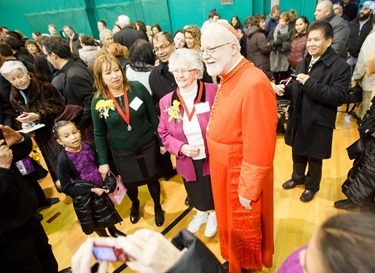 The honorees at the dinner were Myrtle Cruz, one of the foundational leaders of the Black Catholic Community in the Archdiocese of Boston and a devoted member of St. Patrick Parish in Roxbury and Father William Joy, Pastor of St. Angela and St. Matthew Parishes in Mattapan and Dorchester. 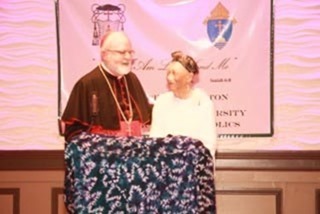 Myrtle received the Bishop James Augustine Healy Award. 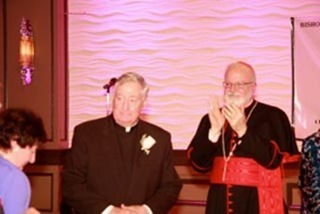 Father Joy received the Robert L. Ruffin Award, both to the enthusiastic congratulations of all present. We give thanks to God for their dedication and commitment. In my remarks, I spoke a little bit about the Healy family and the great number of vocations that came from it. For those who do not know, James Augustine Healy was the first Black Bishop in the United States. He was the oldest of 10 children and his father was Irish and his mother was black. He had two brothers who were priests and, I believe, two sisters who were nuns. As I shared with the dinner guests, vocations come from our homes, our schools and our religious education programs. 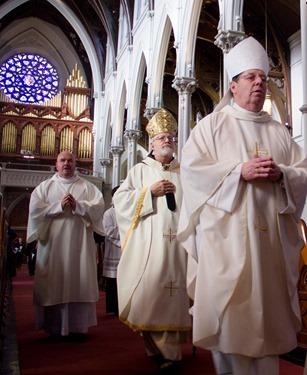 Promoting vocations to the priesthood and religious life are indeed everyone’s business. 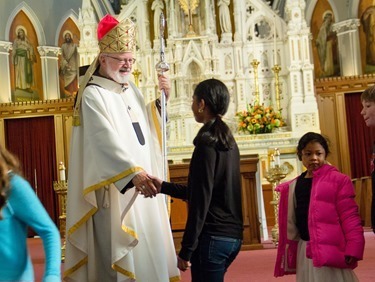 It is my hope and prayer that young people from the Black Catholic community will be inspired by Bishop Healy’s life and ministry. Sunday morning, the Feast of Christ the King, we had the Mass for the closing of the Year of Faith. 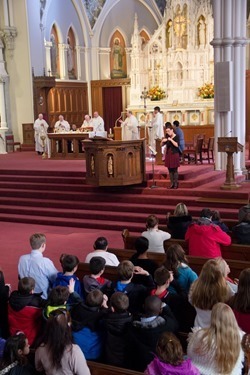 At the mass, everyone renewed their profession of faith. 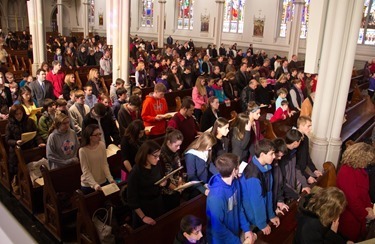 Among the many visitors, there was a very large contingent of young people from St. Patrick Parish in Natick. It was a very beautiful celebration. Then, in the afternoon we celebrated a Vespers service at which we presented our annual Cheverus Awards. 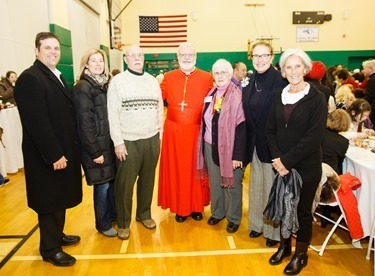 The Cheverus Medal was initiated as part of the Bicentennial celebrations of the archdiocese to recognize those volunteers and workers whose sense of dedication and mission contribute so much the life of our Church. 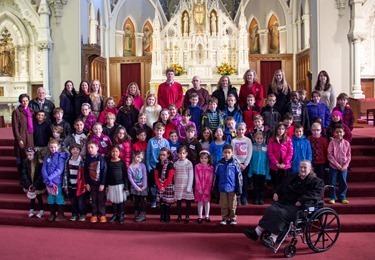 In this season of Thanksgiving, we give thanks to God for the gift of their faith and their lives, and we express our thanks to them by bestowing the Cheverus Award upon them. 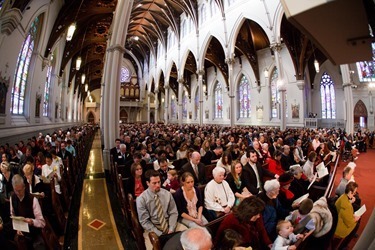 Welcome to the Cathedral of the Holy Cross, on the Feast of Christ the King and the closing of the Year of Faith. 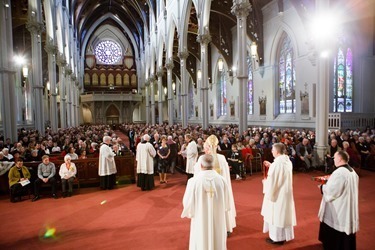 Each year we gather at this time so that as a Catholic community we might express our gratitude to some 100 men and women who have faithfully served the Church in their parishes, our schools, central offices, campus and prison ministries, promoting the Gospel of Life, taking Holy Communion to our shut-ins and countless examples of the corporal and spiritual works of mercy. Without your tireless generosity, I fear the Archdiocese would come to a grinding halt. This year our Feast of Christ the King coincides with the closing of the Year of Faith that marks the 50th Anniversary of the Second Vatican Council. I was in the seminary when Pope John XXIII was elected. Two months ago I was at a consistory where Pope Francis established Divine Mercy Sunday, April 27, 2014, as the date for the canonization of two Popes: John XXIII and John Paul II. Both were spiritual giants in our Church. We are so thankful for their ministry and the ministry of our new Holy Father, Pope Francis, whose love for the poor and the suffering is an inspiration for all. Being a pope or a bishop is like being in a fish bowl made of a magnifying glass. 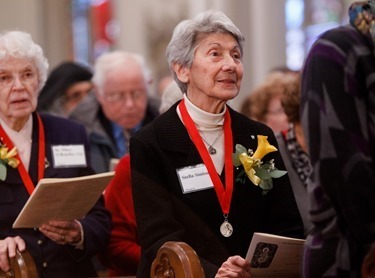 But today, at this Cheverus Award service, we want to put the spotlight on those people whose hidden contributions to the life of the Church go unnoticed. It is significant that Jesus, as part of their seminary training, took his Apostles to the temple to point out the widow who gave everything she had to the temple. Today, we are here because so many make such loving sacrifices and give such generous service without any fanfare or recompense. Today we want to thank them and thank God for them. 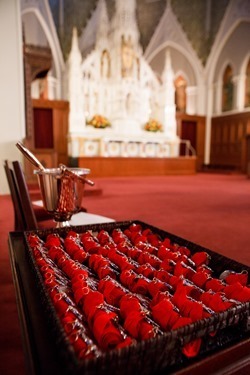 Next Thursday is Thanksgiving and as a Church, we give thanks in each Eucharist, which literally means thanksgiving, because everything we are and everything we have is a gift. Today, we give thanks for our brothers and sisters whose faith has transformed their lives into a prayer of praise and an act of service. Our award recipients are the people who carry the piano. There are others who are content to carry the piano stool or maybe the sheet music. These honorees are our heroes and today we thank them and thank God for their service. The medal has an image on it: that of Cardinal Cheverus, the first Bishop of Boston, two hundred years ago. It was not easy to be a Catholic in those days. Cheverus was from a noble family in France and ordained at the time of the French Revolution. He refused to take an oath, was imprisoned and escaped to England. He came to Boston where we used to burn the Pope in effigy on Boston Common, maybe that’s why it rained when John Paul II came to Boston Common in 1979. Two hundred years ago there were two priests for all of New England and all the Catholics would have fit in this cathedral church. 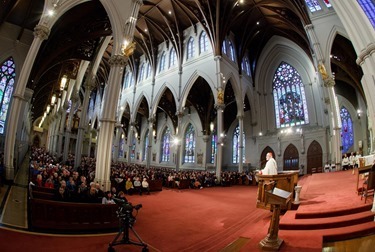 Today almost 2 million Catholics in the Archdiocese of Boston are served by 1,000 priests, but it is still not easy to be a Catholic. Almost all aspects of today’s society are governed by a consumer mentality; shop around until you get the product you need. Often the focus is primarily on what a person wants. When we go to Grandma’s or other family members home for Thanksgiving dinner we might find potatoes that are lumpy, turkey that is dry and pumpkin pie like Styrofoam, but we wouldn’t say, “I am not coming back next year”. As we think about what we want and what we need, we should also think about how we can contribute to the effort. We are part of a family, a community of faith and we are all responsible for what happens and what does not happen. Today, we are blessed to be here to recognize those who recognize that responsibility and are part of the solution. Cardinal Cheverus’s motto is “Diligamus nos invicem”, “Let us love one another”. At the Last Supper Jesus gave us the New Commandment, “Love one another as I have lived you”. There is strength in the unity of loving one another as Jesus directs us to do, as Cardinal Cheverus lived his life and priestly ministry. Today, we honor those who are living that motto and commit ourselves to form a loving and community of faith where people will feel welcomed, forgiven, encouraged and challenged in our desire to be Christ’s disciples in His Church. Finally, At this time of year when we traditionally as a people gather with our family and loved ones to give thanks to God, I want assure all of my readers of my prayers and I ask that the Lord bless you and your loved ones. May he give all of us a grateful heart that moves us to share our many blessings with those around us who are alone or suffering.